On Sunday 10th April we laid up our old Standard in St Mary’s Parish Church and dedicated the new one. The occasion started with a march from Sainsbury’s down to the Church, led by the Shires Royal British Legion Youth Band. On its last parade the old Standard was carried by bearer Tjark Andrews, accompanied by Standards from Kidlington and Stow-on-the-Wold Branches and 136 Squadron Chipping Norton Air Training Corps. At the rear the new Standard was carried, unfurled, by the Branch Chairman. The old Standard was brought into the Church on a slow march, in front of Sir Charles Ponsoby Deputy Lieutenant, The Mayor of Chipping Norton Mike Tysoe, County Chairman of the Royal British Legion Lynda Atkins and officials and members of Chipping Norton Branch. During a moving service conducted by Reverend James Kennedy, assisted by Father Joyce from the Holy Trinity Church, the old Standard was handed into the care of the Church by our President, Neville Edwards. After the service the new Standard was paraded before guest and members before we marched back to the Crown and Cushion. A reception at the Crown and Cushion followed and we were particularly pleased that members of the band could join us, on Remembrance Sunday they have to rush off for another parade. We would like to thank them for their excellent support. We were very pleased at the way the service went and plan to incorporate elements into our Remembrance Day parade and service. Congratulations go to our Parade Marshall Peter Clarke for organising a successful parade. Thank you to everyone who came along and supported us, and all our honoured guests, officiating clergy and the excellent organist who led us in the rousing hymns. Special mentions in despatches for the boys and girls of 136 Squadron who always support us so well, veterans from 2624 Squadron who provided escorts for our Standards, member Geoff Thompson who came up from darkest Sussex with his wife to help with the parade, Mike Dixon, Steve Holland and Malcolm Holland for stepping in as the police were unable to attend and as always to Linda and her staff at the Crown and Cushion for looking after us so well. To ensure our new Standard stays in the best possible condition we have commissioned a purpose built cabinet from local craftsman, Les Kemmett. This now stands in the lounge in the Crown and Cushion where we hold our meetings. As well as our Standard the cabinet contains the older Standard from the Church and our photo yearbooks. The Chipping Norton Branch of the Royal British Legion held a short service of commemoration at the Town War Memorial on Tuesday 31st May at 830pm. In rather wet and windy conditions about 30 Branch members, the Town Mayor and members of the public assembled at the town war memorial. We were pleased to have a contingent from 136 Squadron Chipping Norton Air Cadets, who always support us so well. The ceremony started with Branch chairman, Steve Kingsford, giving a brief (bearing in mind the weather) overview of the Battle. The Reverend Jackie Jones then said prayers before the Chairman told the stories of the two men from Chipping Norton who died at Jutland. Dr Bruce Parker, a Royal Navy veteran then laid a wreath on behalf of the town. Our President Neville Edwards recited the ode "They shall not grow old..............." followed by the Last Post, a minutes silence, Reveille and the exhortation "When you go home, tell them of us and say, for your tomorrows we gave our today. On Friday 1st July we gathered at the Town Memorial to mark the 100th Anniversary of the Somme. The service began with Chairman Steve Kingsford relating an event that happened 100 years ago at that very time, which illustrated the plight of those soldiers involved on the first day. He went on to recite the names of the 11 men from the town who died during the battle, and whose names were on the memorial behind him. Father Tony Joyce of the Holy Trinity Church then said prayers for the fallen and member Derek Sweeten Smith laid a wreath on behalf of the town. President Neville Edwards recited the ode, Les Taylor played the "Last Post" and we fell silent for one minute, following Reveille. the President gave the Kohima exhortation and Father Joyce gave a blessing. In recognition for Chipping Norton's branch's various events remembering the First World war, the Chairman had been presented with a "poppy soldier". This is one of only 141 made, one for each day of the Somme, by artist Nic Joly. He will be photographed at each of our forthcoming events, the results will be shared on social media. On Tuesday 5th July at 7pm the Chipping Norton Branch of The Royal British Legion organised a commemorative event in conjunction with Chipping Norton School. Some 50 members, guests, students and members of 136 Squadron were present, and we were honoured to have with us Mr David Astor, Deputy Lieutenant of Oxfordshire. The first part of the service took place in front of the First World War stained glass window. Mr Simon Duffy, headmaster of the school, welcomed everyone and gave an insight into the window, a joint project between the school, the Legion and the Town Council, which was installed last year. Legion Branch chairman Steve Kingsford then recalled events on the Somme on this day 100 years ago. He went on to talk about the 43 men from the school’s catchment area who died during the battle. Prayers were then said by the Reverend Jackie Jones. Next the stories of two men from the town who fell at the Somme were read. Lexi Lawson told us about Lance Corporal Robert Hyde, whilst Charlie Weaver related Private Tom Trace’s story. Charlotte Hope and Orla Truelove read the poem “In Memoriam” by Ewart Alan Mackintosh who died in the war in 1917, followed by “From one who stays” read by Annalise Kingsford. All five students made an excellent job of the readings and we are very grateful to them for taking on this nerve-wracking task. David Astor then laid a wreath by the window on behalf of the Queen and the town. For the next part of the service we moved to the lovely library garden. A cross had been made for all of the 43 local men who died in the Battle of the Somme, many with a photo of the man attached. In silence the assembled company laid one cross each, the only sounds being bird song and the trickle of the garden fountain. The moving atmosphere was made complete by the rays of the westering sun falling on the garden. 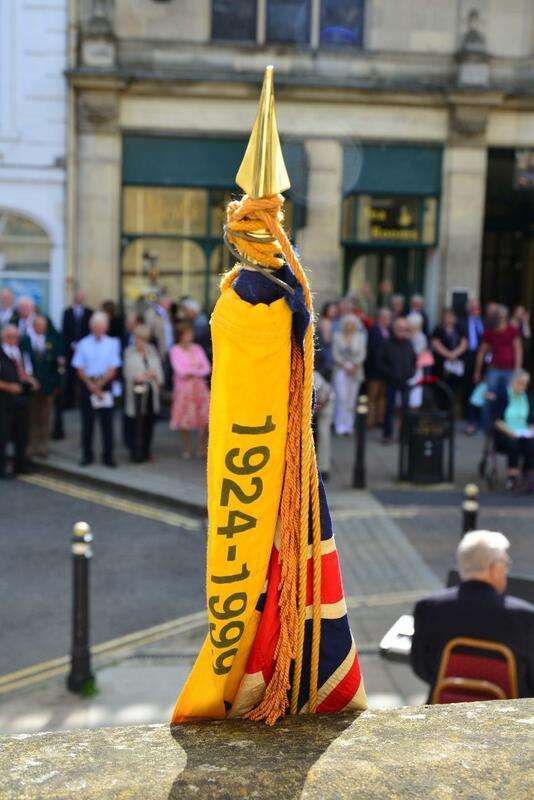 The President of Chipping Norton Royal British Legion, Neville Edwards recited the ode, “They shall not grow old…..” followed by “Last Post” played by buglers from The Shires Royal British Legion Youth Band, who support our events so well. A minutes silence was held followed by reveille and our President reciting the Kohima Exhortation, “When you go home tell them of us and say, for your tomorrow we gave our today”. Father Tony Joyce from the Holy trinity church said a final prayer and a blessing before Neville Edwards thanked everyone for coming. The boards were dedicated at a service held on 11th September to commemorate the RAF Central Flying School based at Little Rissington, organised by the North Cotswold branch of the Royal Air Force Association. President Neville Ewards, Chairman Steve Kingsford, Parade Marshall Peter Clarke, carrying the Standard, committee members Phil Nicks and Gareth Preston with youth member Annalise Kingsford attended from the branch. Tony Pick and Dom Oliveri from 136 Squadron Chipping Norton ATC and Stwo on the Wold branch and the RAFA standards were present. Our president read one of the lessons in the service, which was moving and well attended. Afterwards we enjoyed tea at the village hall. "The Legion of the living salute the Legion of the Dead, we shall never break faith with you"
The children of Holy Trinity then came forward to lay crosses for each man on the memorial who died 100 years ago in 1916, some 24 crosses in all. Wreaths were then laid on behalf of the town, Chipping Norton Royal British Legion and the Women's section, WODC and the Freemasons. We the had some timing issues so our President Neville Edwards stood in with some off the cuff observations until it was time for the Last post, ode and two minutes silence, with Father Tony Joyce leading the service. Some of our number went to the Crown & Cushion to warm up whilst a party of use, including Standard Bearer Tjark Andrews and the cadets went to Over Norton.In front of the war memorial there the Chairman recited the exhortation and two minutes silence observed followed by the Kohima Exhortation. We then proceeded to Little Rissington Churchyard to meet the Reverend Christopher Etherton for a service to remember the airmen and one air cadet who died in training flights in Chipping Norton. With us were the Professor and his wife and Father Joyce and the cadets. Gathered around the war memorial on a sunny afternoon we made the usual remembrance and laid an RAF wreath. After the cadets found the graves of all those who died in Chipping Norton, mostly on the relief airfield, and laid crosses on their graves, our President, an ex Sapper, laid a cross on the one Royal Engineer who lies here, who died whilst the runways were being re-surfaced. A special word of thanks to the cadets, mostly new entrants, and their Warrant Officer Tony Pick who stayed with us all day. Their behaviour was impeccable and they took an interest in everything we did, we are very proud of them. Thanks go to Simon Duffy at the top school for letting them have the time off. We were up early next morning for Poppy collecting in the town centre, the weather was unkind with heavy rain, but everyone was cheerful and enthusiastic. The cadets joined us again in numbers, and if they were fed up with the sight of us they didn't show it! We were kept warm by free drinks kindly supplied by Cafe Nero. Remembrance Sunday dawned clear and bright as it always seems to do, and as ever good numbers turned out for the parade. Before marching off the chairman had the task of tapping the firkin of bitter, kindly donated by Hook Norton Brewery, which was sitting in the town hall and testing it was fit for our guests to drink. Dirty work but someone has to do it. The parade moved off at 1010 to allow more to time to lay the increasing number of wreaths. The church service was as ever extremely moving, led by the Reverend James Kennedy, the music by the Accidentals Brass Ensemble and the last Post from the buglers of the Shires RBL Youth Band were all superb. Sadly during the two minutes silence a member of the congregation was taken ill and fortunately was helped by paramedics and fire fighters who were present. We are pleased to say the gentleman concerned has now recovered. Towards the end of the service the Vicar blessed a new drum brought for our superb marching band by the Legion and the Armed Forces Trust of Chipping Norton. We then marched back to the Town Hall, passing by the War Memorial, where members of the ATC were forming a Guard of Honour. The parade was addressed by our President and the Mayor before refreshments were then taken in the Town Hall, courtesy of the Town Council and it was all over for another year. The day went off spectacularly well and thanks are owed to Parade Marshal Peter Clarke and his team for their hard work ensuring the occasion was a fitting and moving tribute to the town's Fallen. Our thanks go to everyone who participated and watched and all those whose efforts made the day a success.